Size: 4 & 9 oz. Godseye Body Butter is fast absorbing, super luxurious and smells like a sensual delight. Non-Greasy, Light, Fluffy and Whipped to perfection. Can also be used as a hair styling cream or applied to ends for an overnight hair mask. Smells and feels luxurious and Earthy, one of my favorite beauty products, Thank you! I am a nurse and consider myself a hand/body lotion expert.I have done loads of testing/searching for the perfect lotion for hands so dry they hurt. There is no dry skin like nurse dry skin! I love lotion with natural ingredients but they were always too greasy or too thin and would just plain not work. 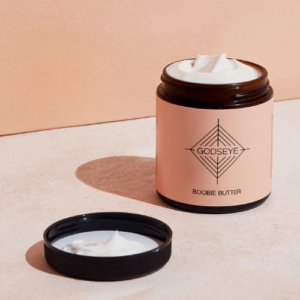 Body Butter is from another planet-good! I love the creamy, whipped texture. This butter melts into my skin and leaves it soft and nourished all day. Its in my most favorite GODSEYE scent VISION QUEST so I use it in my daily ritual. I have quit using any styling products in my hair and just rock GODSEYE body butter instead. I also mix this butter into my SPF so I can take this scent to the pool! Obsessed! YUM. Luscious, silky, dreamy! 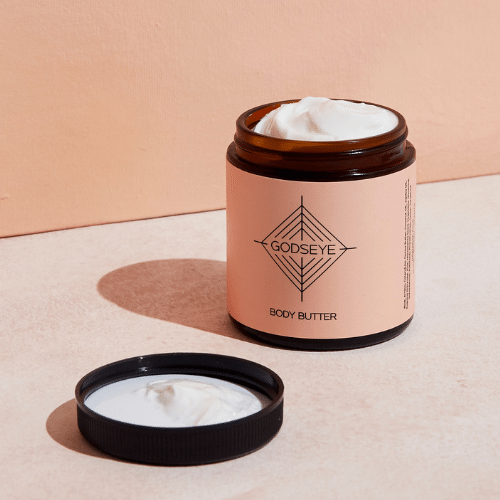 I love this Body Butter and how my skin reacts to it. Instantly, my dry prone skin absorbs this lotion, making it feel soft and supple. The smell is delicious and rich. Throughout the day, I love how I can still smell it. Plus, it blends beautifully with other Godseye Oils products. As a massage therapist with psoriasis and extremely dry skin, I use this creamy, non greasy, amazingness every single morning and evening and my skin feels so good and supple. My clients tell me I smell like healing and the earthy fragrance helps keep me grounded throughout my days! This stuff has saved my skin and kept it calm and happy.